Pathways to Promise would like to share with you the Diversity Awareness Partnership’s Interfaith Calendar. It is distributed annually and features observances celebrated across 26 religious traditions. We encourage you to download it and use this calendar as a guide to better understand, acknowledge, and respect friends’, neighbors’, employees’ and co-workers’ holidays. 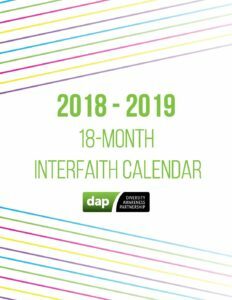 To learn more about the Diversity Awareness Partnership or if you are interested in ordering calendars for your home, office, school or place of worship visit their site at dapstl.org .